First thing you need to do is go right to the ingredients (don’t worry about the nutrition label with the calories, fat, or carbs just yet). The first thing I notice is that there aren’t many things listed on the ingredient list – great news! Ingredients: specially selected potatoes, canola oil, natural color, sodium phosphate. The only two ingredients in these McCain Breakfast Potatoes that you need to be careful of is the natural color and the sodium phosphate. You have to go to the FAQ page on the McCain website so see that the natural color is made from caramel and annatto. That is pretty normal for packaged food so it isn’t a huge issue. The sodium phosphate is retain the natural color. Again this isn’t a very big deal, but going 100% natural would be a better option to get rid of these unnecessary ingredients (more on that shortly). OK so thumbs up for the ingredient list, as it is looking pretty healthy – lets take a look at the nutrition facts. Per 2/3 cups you are looking at 120 calories, 4g fat, 20g carbs (which only 1g is from sugar), and 45mg sodium. I would estimate that most people would be eating about 2 “servings” per breakfast, so you will need to double those numbers. 240 calories, 8g fat, 40g carbs. These numbers are a little high if you are on a strict diet and are trying to lose weight. If fat loss is your goal I would recommend keeping the portion size limited and eating these breakfast potatoes either a few hours before a workout or sometime pretty soon after a workout. I often recommend limiting these starchy carbs for optimal fat loss and if they are eaten they should be close to a workout. To compare these breakfast potatoes lets look at the popular McCain Diced Hashbrowns, which one may thing should be very similar to the breakfast potatoes. If you take a look at the ingredients right away you should be EXTREMELY alarmed. The list of ingredients has got to be about 20+ ingredients long. You will notice for the same 2/3 cups serving size you have 160 calories, 8g fat, 21g carbs, and 450mg sodium. These are unhealthy and I would stay away from them! 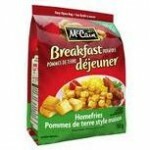 Overall the McCain Breakfast potatoes are pretty healthy, and they could fit into your breakfast. If you are really serious about losing weight/fat I would recommend that you make your own breakfast potatoes. It will take a little more work, but it isn’t that hard and you can eliminate some of the unwanted ingredients. Simply buy your own potatoes, throw them in the microwave for about 3 minutes after poking holes in them, and then dice them up and throw them in some cooking oil in a skillet.